When we heard the news of Lush’s new Colour Supplement we suddenly realised how totally crazy it was that no one had pipped Lush to the post with this multi-purpose pot of goodness. So what is Lush Colour Supplement? Well it’s whatever you want it to be really. A foundation, a tinted moisturiser, a concealer. Take your pick. The colour base can be used in combination with other products or simply on its own. It works fabulously as a tinted moisturiser because it doesn’t require you to change you regular moisturiser. You know how it is when you find a great face cream and come summer you have to hunt for a tinted version as foundation is often too heavy in the heat. The colour supplement comes in four different colours so pick one that suits your skin tone and mix it with you favourite moisturiser on the back of your hand before applying as normal. The colours choices include Dark Pink which is the darkest available shade for people with a healthy glow or pink skin. Dark Yellow works best for olive skin tones and light yellow and light pink have been created for an ivory skin tone and pale pink complexions respectively. All colours are made using a blend of soya and rice bran oils and do not negatively affect the skin like mineral oils would, whats more is that this product is not tested on animals and it is totally one hundred percent suitable for vegans! If you are going on a night out and want a longer lasting look than the tinted moisturiser option then use the colour supplement on its own as a foundation. You can also dot a little around unsightly blemishes for effective coverage. This one product fits all means that you no longer have to carry round your entire make-up bag with you, leaving plenty of room in your handbag for the kitchen sink. 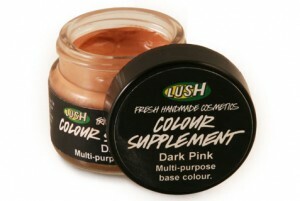 Lush Colour Supplements come in at £7.50 for 20g and can be purchases from the Lush website or in-store.